Clueless or intentional? Senator Bill Nelson, in a close campaign for re-election against Governor Rick Scott, sent a fundraising email for hurricane Michael relief that directed users to the ActBlue web site, a Democrat fundraising PAC, which could capture donor's email addresses. He also tweeted out the ActBlue link. "ActBlue is a nonprofit, building fundraising technology for the left", according their website. 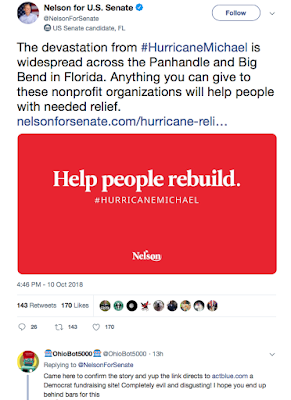 Quite a tasteless act from Nelson, directing users to a left web site under the guise of hurricane relief, while many of our fellow Floridians are devastated by hurricane Michael, literally digging themselves out from the horrific storm. He decides to use a Democratic activist site where contributor's email addresses could be harvested for more political fundraising, as he is in the battle to save his political life. Nelson had recently sent emails, including those in the path of hurricane Michael as the storm was bearing down, into sending him money. “Losing Florida would cost Democrats the Senate." Never mind the consequences and horrific damage and impact to Floridians from hurricane Michael. 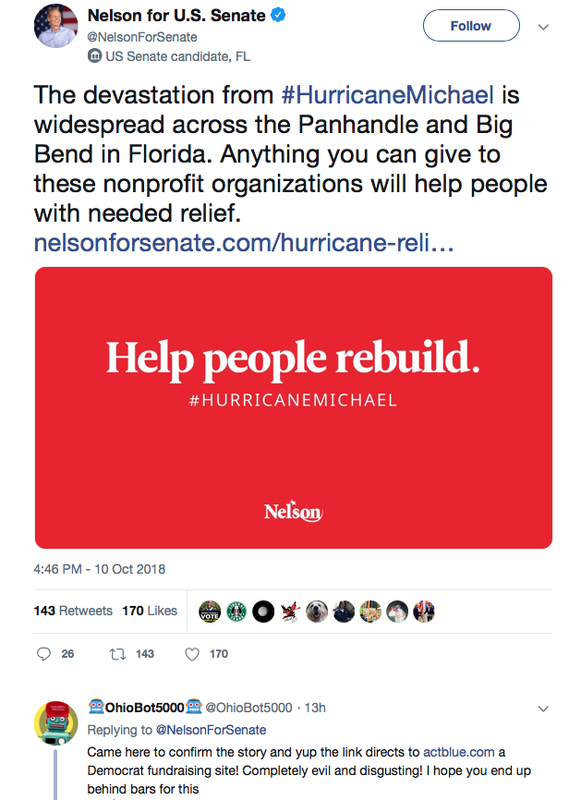 Nelson would never let a disaster as an opportunity to fundraise go to waste.